Beth Williams is President of Greenery Wizard, Inc. Beth has a true passion for creating gracious garden scenes and outdoor spaces that are inviting, lush, pretty, intimate, and tropical. Along with Beth’s passion for gardening, she brings a love of Florida nature, a certification from FNGLA in Florida Horticulture, knowledge and training in design, and experience in managing landscape installations. 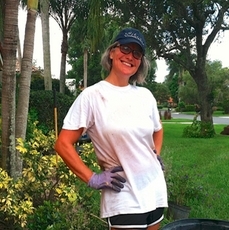 Beth’s mission: to bring beauty, color, privacy, shade, whimsy, and value to yards throughout Naples and Collier County – including yours!